The leadline classes at the Upperville Colt and Horse Show are extremely popular with tons of entries and a huge crowd of spectators lining the ring, taking photos and encouraging the young competitors. Upperville is the oldest horse show in the country, dating back to 1853. It attracts the nation’s top ranking hunters and jumpers as well as local ponies, sidesaddle ladies and racing Jack Russell Terriers. 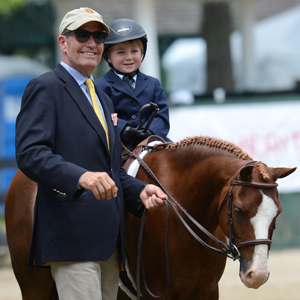 In the leadline classes, you might see some of the top riders, trainers and handlers such as Scott Stewart, Snowden Clarke and Oliver Brown leading young riders on perfectly turned out ponies. The leadline classes are held in the main ring under the canapy of majestic oak trees. Classes are offered for ages 1 -3 and for ages 4 - 6. Being Upperville, you'll ususally see a number of sidesaddle leadline entries along with leaders in fashionable hats or very traditional, horsey attire.